It is no coincidence that one of Hollywood’s most famous jogging montages takes place in the City of Brotherly Love. Although you may not be training to jump into a boxing ring like Rocky Balboa, running through Philadelphia can be quite an invigorating and scenic exercise experience. When it’s time to lace up those sneakers and hit the trails, check out these spots while planning your next running route. As the largest urban park in the United States the 9,200 plus acres of winding trails and scenic topography make up Philadelphia’s Fairmount Park. Olympic marathon runner Jen Rhines spoke of her days running through Philadelphia in Running World Magazine. 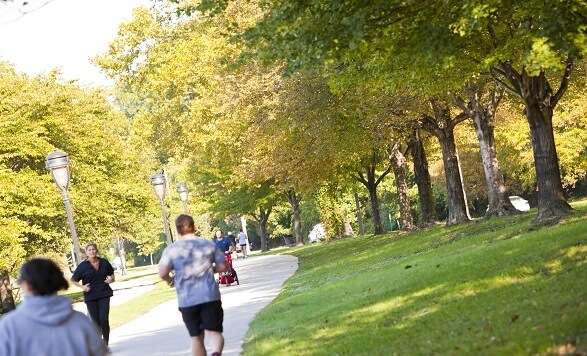 She stated, “In college I ran my hardest tempo runs in Fairmount Park, and I trained for the Athens Olympics here.” Whether you are looking to run your fastest or take a relaxing jog, Fairmount Park offers trails for all levels. A superhighway for runners and cyclists is Forbidden Drive – a beautiful 5.5 mile gravel path along the Wissahickon Creek. Do not be disheartened by its ominous name, this stretch of gravel is only forbidden to motor vehicles making it an ideal place to go for a run. If you are looking to see something truly famous during your on foot journey, check out Kelly Drive, a beautiful 8.5 mile stretch of road along the Schuylkill River highlighted by picturesque Boathouse Row. Nestled between Center City and the Schuylkill River, this recently completed Philadelphia portion of this trail extends for 11.5 miles up the eastern riverbank to historic Valley Forge. While addition sections to the north and south are still under construction, the Schuylkill River Trail will one day run from Fort Mifflin in Philadelphia to Schuylkill River County – approximately 140 miles. If you are running in Philly, the classic run toward and up the Philadelphia Art Museum’s steps is a must do. As runners navigate northwest on this path toward Broad Street, the charming row homes lining South Philly’s streets slowly give way to the impressive skyscrapers of Center City. Recreate the film by heading west at City Hall onto the Benjamin Franklin Parkway. Flags from around the world line the path as the Philadelphia Museum of Art looms ahead. Catch your second wind, race up those steps, spin around and gaze at the view from the top while triumphantly holding your arms in the air! Philadelphia is home to some of the country’s richest history as well as tons of splendid scenery. Whether you are a leisure jogger or a serious runner, there are tons of places to suit your taste of landscape and views as you make your way through the city. Between the countless marathons held in Philly throughout the year, such as The Rock’n Roll Half Marathon, The Color Run, The Broad Street Run and the Philadelphia Marathon as well as the picturesque views of Fairmount Park and other trails, Philadelphia offers an ideal place for runners of all levels to enjoy their time traveling on foot in the city named one of the top eight trail cities in the United States by Trail Runner magazine (December 2015).